Vanilla extract has many uses, especially for baking. Making your own will allow you to have fresh vanilla extract whenever you need it. This is a guide about making vanilla extract. Add the two split vanilla beans to the brandy. Cork it/put lid back on. Let sit for 2 months before using. Vanilla extract gets expensive if you bake a lot and, with the holidays approaching, there is always that annoying discovery of an empty extract bottle. 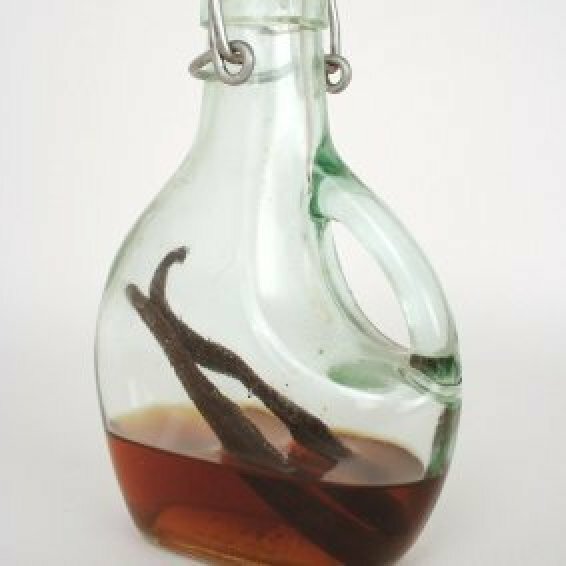 Never fear, you can easily make a cheap and never-ending bottle of vanilla extract! Just score the vanilla beans lengthwise down the middle, put into the bottle and fill with alcohol of your choice and close. Let it sit for a few weeks for the flavor to absorb into the liquid, then just top off with more liquor when it gets to half empty. No waiting necessary after the initial set time. Way cheaper since you will never have to buy vanilla extract again and I think it has a better flavor. This is a great gift for cooks and housewarming. I make these up in fancy bottles and add a pretty tag, sometimes all by itself or add to a basket with other cooking supplies. Editor's Note: Periodically check to see if vanilla pods still have an aroma. If not, discard and replace with fresh vanilla pods. I want to purchase vanilla beans to make my own vanilla extract. I do not like imitation vanilla. I'm not sure of the quantity of beans to purchase so I was wondering what are other uses for these beans? You leave the beans in the extract so you can make more! They will not go bad as the alcohol serves as a preservative. When I make it I use a 1/2 pint of vodka or very good brandy. Split 3 vanilla beans longwise but not all of the way through. Add to the liquor & shake. Put the bottle where you will see it & shake well a few times a week. It will take 2 to 6 months (sometimes longer) for your vanilla to 'make'. I made 2 bottles for my own use because when the 1st bottle gets low I can add more liquor to it & still have homemade vanilla to use while the 1st one 'makes' again. You can use the vanilla beans over & over again. So far, I have used the 1st bottle for 4 years, & the 2nd for 3 years. I have made a lot of homemade vanilla for Christmas & housewarmings & always get raves! I always make my own Vanilla extract. It's much tastier and when I make in bulk, I give away the extra as Christmas gifts in bottles I get at the Dollar store. Just go to the liquor store and buy a fifth of Everclear. Buy 3 vanilla beans, split them down the middle and open a bit and drop them in the bottle. Keep in a cool dry place. I keep mine in our cold room. Shake the bottle every week. It usually takes about 3 months for the color and flavor to develop, so make well in advance if you plan on giving as a gift. This makes a very concentrated Vanilla so you only have to use half the amount called for in any recipe. The fragrance is much stronger and smells so good. Source: I have to give credit to my sis, Pat. She told me how to make it a few years ago and I have been doing it ever since. Editor's Note: Everclear is not available in many parts of the U.S. due to it's high alcohol content. Try substituting a high proof clear alcohol such as 100 proof vodka or ask at your local liquor store. Has anyone made their own Vanilla Extract? I read somewhere that you can soak Vanilla beans in Rum and that does it, but I am wondering if anyone has had experience with this and what the proportions would be? My husband brought me a bottle one year ago from Mexico (organic) and it is great! I refuse to use artificial because of quality and I bake A LOT for my kids. Plus, I use it as mosquito repellent (no joke!). I don't mind the investment for high quality. Try your hand at making your own vanilla extract. Take a clean jar & pour into it 3/4 cup. vodka & 1 split vanilla bean. Seal the jar & allow to stand for six months, before using. I use a one liter bottle of vodka and add 2-3 vanilla beans, let it sit for one month, the longer the better. As you use it, keep the bottle full by adding more vodka. You will never run out of vanilla. I keep a small bottle (I reused a vanilla extract bottle) in my pantry for my baking needs. My friends and I have been doing this for over ten years. Where is the best place to get the beans? I too will never sacrifice taste and quality for cost, however this recipe is time consuming not expensive. Just be sure to use premium spirits for best quality. Vodka is fairly neutral, rum sweet and brandy pungent. Split the vanilla beans lengthwise, exposing the seeds but keeping the ends intact. Place the beans in the alcohol and cap the jar tightly. Store in a cool, dark place (the bottom of your pantry closet is a good choice), removing to shake the jar a couple of times a week. The extract must remain in the dark for at least four weeks, but four months make it even better, the longer it stands, the stronger it gets. Pour the extract through cheese cloth into a large pitcher and then into bottles, placing one bean in each. Cork tightly, label and date. Use for your own baking or slap on a pretty label and give as a gift. I have had this recipe for years, but have never tried it. I make my own on a small scale. I took an old vanilla bottle and placed 2 whole vanilla beans (from my bulk healthfood store- which are a lot cheaper) and filled the bottle up with at least 80 proof vodka (I happen to use Popov). Shake it everyday for about a month. I use it after a month, and though I have had the beans for about 4 years now, I think they are loosing their potency, as it takes longer to make the same tint in the bottle as when i first got them.